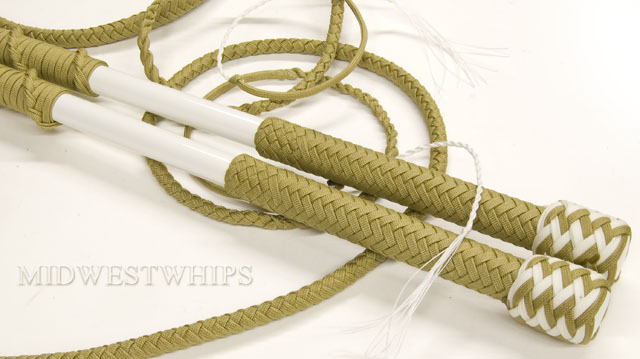 For the 2010 Queen Mary Indy Gear Summit, MidWestWhips has donated this matched pair of Gold and White Performance Hybrid Nylon Whips. 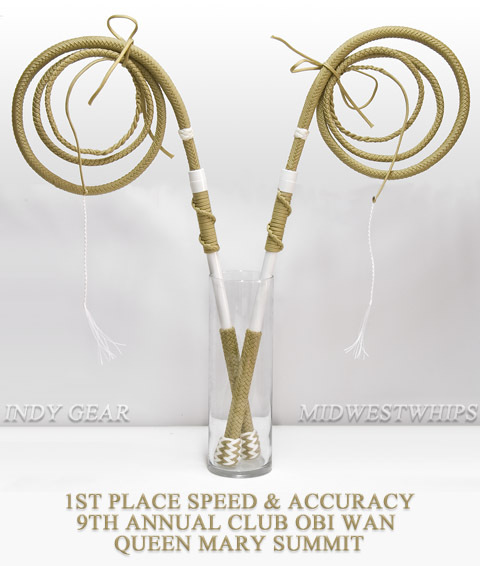 They were awarded to the first place winner of the Indy Gear Summit’s first annual speed and accuracy whipcracking contest, which this year was a gentleman named Daren. We are proud to support the growth of American whipcracking, including both precision targeting and two-handed whipcracking. And we were honored to be able to help with the judging and preparation for what will hopefully become an annual fun competition every year at the Indy Gear Summit. As you probably have already noticed, this is not a PH Nylon Whip like all of the other whips so far in this photo gallery blog. 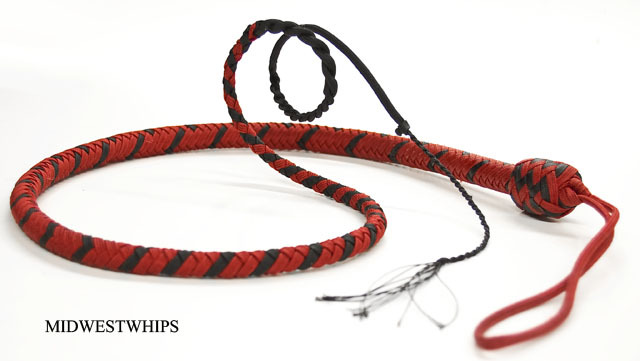 Tentatively, we are calling this new type of whip the Performance Hybrid Signal Whip, or PHS12 for short. 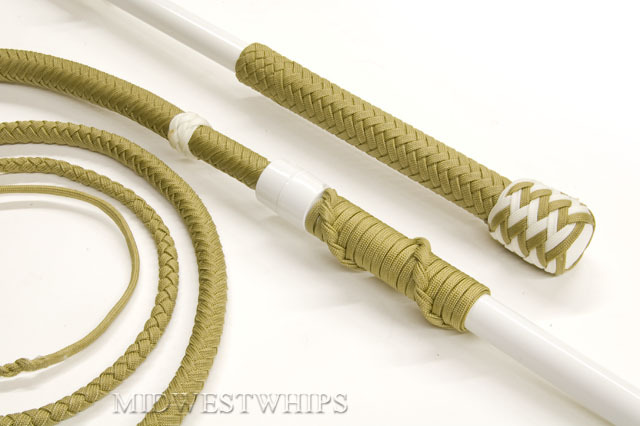 Equivalent to approximately a regular 4ft signal whip, it is perfect for indoor use, and performs both flick style and cattleman’s style cracks with ease and accuracy. 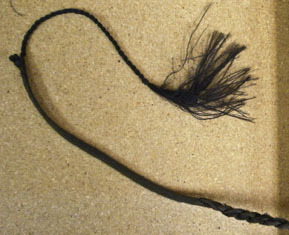 The popper/cracker is attached in the same way a snake whip or bullwhip’s popper is attached, so it is very simple for the user to replace as needed. The PHS12 is not yet available for order because we are very serious about testing any new designs thoroughly in order to make the best balanced and most durable whip we can. 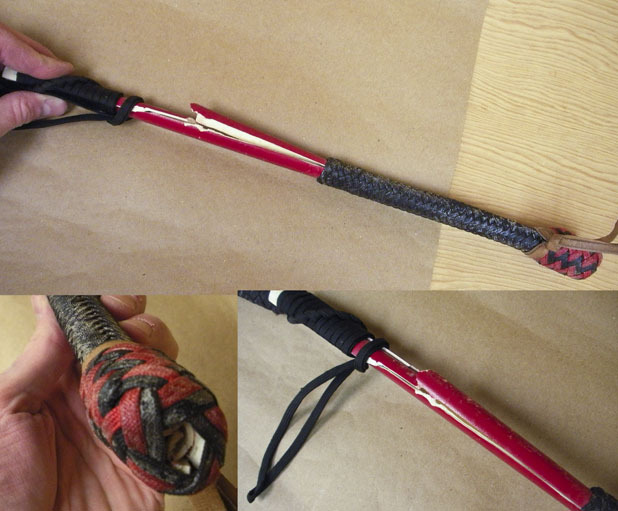 We have been experimenting off and on with different designs for a nylon signal or snake whip for quite some time now, but finally settled on this design in late spring this year. Since then, we have made several for testing purposes, and put them in the hands of both professional and novice whipcrackers across the country, from New York to California. The PHS12 whip pictured above is one of these test whips, as is the neon pink and white Hello Kitty themed whip to the left. So far with this design, we have heard a lot of positive feedback, so you can very likely look forward to us beginning to offer this PHS12 model sometime in the near future. When it becomes available, we’ll make another announcement here on this nylon photo gallery blog, as well as adding detailed information about the whip and how to order on our main MidWestWhips website. Stay tuned! He’d pulled his PH whips out one day and set them down on the back of his car so that he could do something else then come back to play with them later. But before he had the opportunity to come back to his car and use the whips, he unexpectedly had to leave in a hurry. Distracted and in a rush, he jumped into his car and drove away with the whips still laying on top of his closed trunk! The whips slid off within a few moments, when he was already out on the road, and he didn’t realize his mistake or have time to look for them until the next day. So, the pair of performance hybrid whips spent the night on a busy road, being run over by hundreds of vehicles from cars to trucks to semi trucks. The handles were basically destroyed as you can see, but he said that the thongs seemed to still be in usable shape after he rolled them round again (the traffic had flattened them). So he ordered a couple of replacement handles, and I was just able to finish them earlier today. Hopefully he will be kind enough to let me know how the whips are performing after he receives the handles and attaches his old thongs to them, and maybe even send a few pictures. If he does, I’ll update this post with the news.